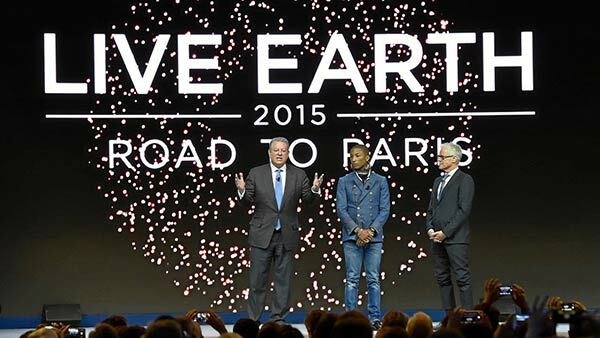 Al Gore, Pharrell Williams and Kevin Wall announce Live Earth: Road to Paris. DAVOS, Switzerland (WLS) -- Al Gore, Pharrell WIliams and Kevin Wall announced the launch of a year-long campaign called Live Earth: Road to Paris at the World Economic Forum in Davos, Switzerland, Wednesday. The campaign's ultimate objective is to collect 1 billion signatures to demand environmental accountability from world leaders to reach a binding agreement to tackle climate change at the 2015 United Nations Climate Change Conference in Paris in December. On June 18, Live Earth: Road to Paris concerts will be held in six cities on six continents: Paris, New York City, Johannesburg, Sydney, Sao Paolo and Beijing. Pharrell Williams will serve as creative director for the event, while Kevin Wall will produce. For more information, visit www.liveearth.org.